Exerz's magical sequinned journal features in shining, eye-catching, fun, and reversible sequins. Simply run your fingers across the sequins, to get a different colour or a picture/word, or any other patterns in your imagination. Dimension: 14.8 CM x 21.5 CM x 2.2 CM / 5.8 x 8.4 x 0.8 inches. Material: Paper and sequins. Perfect for handbag, school bag, or use at home. A unique and fashionable gift for birthday, Christmas, kids party, festival, or for yourself. Care: wipe clean. 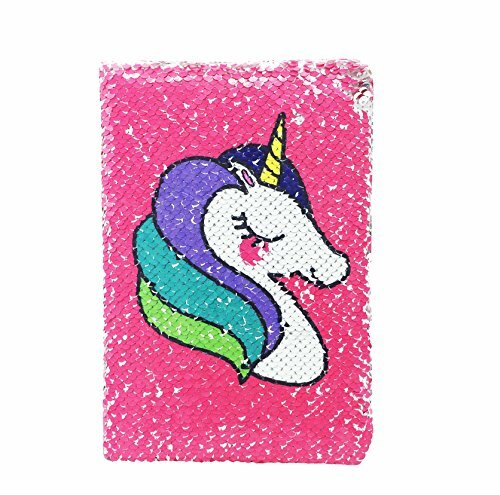 Exerz's magical sequinned journal features in shining, eye-catching, fun, and reversible sequins. Simply run your fingers across the sequins, to get a different colour or a picture/word, or any other patterns in your imagination. Dimension: 14.8 CM x 21.5 CM x 2.2 CM / 5.8 x 8.4 x 0.8 inches. Material: Paper and sequins; Each book contains 80 sheets / 160 pages. Perfect for handbag, school bag, or use at home. A unique and fashionable gift for birthday, Christmas, kids party, festival, or for yourself.